There’s been a lot of news about Trump Tower recently – from Mayor Bill de Blasio’s bill to Congress for the $35 million a year cost for Donald Trump‘s security detail to Curbed NY‘s report this week that real estate brokers are already promoting the building as “the most secure building in Manhattan.” But equally important for New York City residents is whether the privately owned public spaces (POPS) inside Trump Tower will still be accessible with the increase in security measures. After all, Trump received zoning floor area ratio (FAR) bonuses for building the public spaces at 725 Fifth Avenue, which amounted to 105,436 square feet – about 14% of Trump Tower. He received an additional bonus of 105,437 square feet for providing retail within the special Fifth Avenue Subdistrict. But even before Trump’s Presidential campaign and election, these spaces were noted to be not clearly accessible by both experts on the city’s privately owned public spaces and the City of New York, which levied a fine just this year. According to the Jerold Kayden, author of Privately Owned Public Space: The New York Experience and the Frank Backus Williams Professor of Urban Planning and Design at Harvard University Graduate School of Design, on his extensive website documenting New York City’s POPS,“The covered pedestrian space at Trump Tower is simultaneously New York City’s most famous and least understood privately owned public space.” With the marble and gold details, this POPS is one of the least recognizably public in the city. To further compound the issue, the nature of the POPS in Midtown, like those along 6 ½ Avenue for example, have historically been contentious – incursions by building owners happening piecemeal over time. The Parker Meridien has been battling with the city about its lobby – technically a publicly accessible arcade since 1979, which is now partially a Gothic-style cafe called the Knave. The public space at Trump Tower technically covers the main lobby, the lower level concourse, and two landscape terraces on upper floors. The POPS amounts to 6,626 square feet in the interior of Trump Tower and 6,336 square feet across the landscape terraces. The metal bench that sits there today is not the original stone bench that had been there for decades. This is not the original stone bench that was originally located there. The current bench appeared only following a $14,000 fine levied on Trump Tower Commercial LLC in August last year for removal of the bench and illegally placing two sales counter in its place. Additionally, with today’s media frenzy surrounding Trump and the election, the bench is sometimes roped off and often occupied by a bevy of journalists hoping to catch a glimpse of someone, anyone, Trump related coming out of the elevator. Security-wise, visitors now have to put their belongings through a Secret Service operated X-ray machine upon entering both at Fifth Avenue and through the connecting privately owned public space at 590 Madison. Security personnel, whether NYPD or Secret Service abound, and certain elements that are required to be accessible under the POPS designation are not anymore. For example, escalators are supposed to access concourse, street level and all upper floors, but the escalators above the second level (where Starbucks is located) are roped off during some of the open hours. We spotted several Secret Service agents on the lower level atrium where the food concessions and an elevated public seating area are located. Kayden notes that in the past, like at the Parker Meridien, “nearby food outlets have indulged in episodes of café creep, spilling out into the covered pedestrian space. It is important to recognize that members of the public may sit at any of these tables and chairs without obligation to purchase anything. Public restrooms are located at the end of a corridor leading from the southwest corner of the space.” Now, you’ll share the tables with Secret Service too. There are also two landscaped terraces that are part of the public space amenities built into Trump Tower but they have been difficult to find from the beginning and the lobby lacks effective way finding signage. When the escalators are roped off after the second floor (which occurs until about 10am in the morning, and starts again in the late afternoon), this also means that you can no longer access the landscaped terraces by escalator. The terrace levels were also once accessible through two floors of Nike Town, but that is no longer the case. Now, the only means to access the terraces is through the main elevator bank which is guarded and packed with press—not exactly welcoming. From what we could see the only noticeable signage was above the main elevator bank, offering access to “Public Gardens at Terrace Level C & D.” We spoke to a few Trump Tower employees, who confirmed that the terraces are still open to the public but sometimes close early “due to weather.” In the last week, they’ve been closed at least twice on our visits. 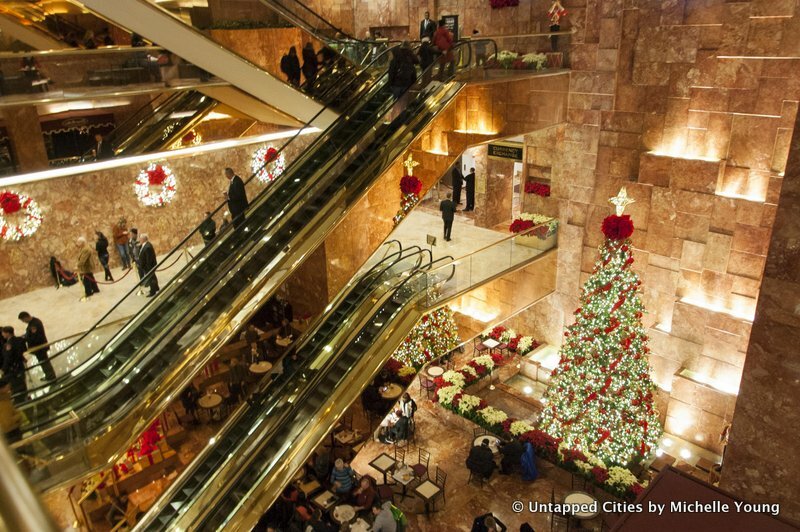 They are technically supposed to be accessible when the stores at Trump Tower are open, which is 9 am to 6pm on weekdays and 10 am to 6 pm on weekends, which is already fewer hours than the minimum hours generally permitted when a nighttime closing of a POPS has been authorized. As of our visit today, the fountain is still off but the table and chairs are back. The other terrace, facing south was closed for maintenance. The staffer at the front desk told us it was not normally closed, but he did not know how long it would take to open it again. There is also an indoor passageway that connects to Niketown and the indoor POPS at 590 Madison Avenue, although it doesn’t add to the square footage of the POPS itself. To enter Trump Tower through the passageway, you now have to go through an X-ray machine as well. There has been a clear, documented history of incursions on spaces inside Trump Tower that are legally mandated to be publicly accessible, and priority given to security and press even before the inauguration of Donald Trump as President of the United States, has further eroded those rights of access for the public. The only question now is how far more will this access be reduced once Trump is sworn in. Next, check out 10 indoor public spaces for your very own urban oasis. The public space amounts to 20 floors, or he was able to build an additional 20 floors in exchange for the public space? He was able to build an additional 20 flowers for the public space. Nice article, as usual, Michelle. I like how you photo-documented this so well. Shame it is so inaccessible. Probably nothing to be done about it for 4 years now. I walked by there a few days ago at night and could not believe how many police and barricades there are- even all the way to the Apple Store where I saw 2 dozen police.